I still don't know yet or where this company is heading to. Late last year Nokia released Nokia 7. HMD Global is set to take this year by storm as we are expecting to see lots of surprises at the (MWC) Mobile world Congress trade fair this year. 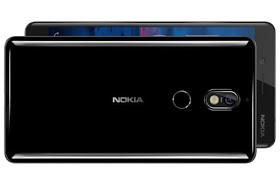 Nokia 7 Plus will come with 12MP + 13MP Dual-lens Zeiss camera on the back. The rear camera has 2X optical zooming capability. It will pack 6-inch, 18:9 resolution display. A 16MP Zeiss front camera will do the duty for selfies and bothies. >>Aluminium unibody coated to provide Ceramic texture and feel. Dual-color accents on camera and around the edges like Nokia 6 2018. >>12MP + 13MP Dual-lens Zeiss rear camera with 2X optical zoom. >>Nokia/Lumia Camera like Pro mode. Bothie.